Cumberland was originally settled as part of Rehoboth, Massachusetts, which was purchased from the local Native Americans by the Plymouth Colony. It was later transferred to Rhode Island as part of a long-running boundary dispute. The town was named in honor of Prince William, Duke of Cumberland. A machine shop in Cumberland made the first power looms for woolens in America. These were reportedly used at the Capron Mill in Uxbridge, around 1820, that burned in a recent spectacular Bernat Mill fire. Cumberland is home to the headquarters and original location of the Ann & Hope chain of discount stores which claims to be the first chain of discount department stores in America founded in 1955. Cumberland is the easternmost town along the state's northern border with Massachusetts, making it the state's de facto northeasternmost town. 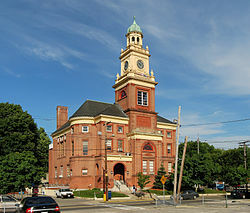 Cumberland borders the Rhode Island cities of Woonsocket to the northwest and Central Falls, to the south and the town of Lincoln to the west as well as the Massachusetts town of Wrentham to the north and the Massachusetts cities of North Attleboro to the east and Attleboro to the south east. The only large deposit of Cumberlandite, an iron-rich mineral, is found off Elder Ballou Meeting House Road in northern Cumberland. Though the ore was used to make cannons during the colonial era, the resulting casts were of poor quality and prone to cracking. A major geologic feature of the area is Diamond Hill, a massive outcropping of white quartz. The hill once was host to two small ski areas and is now a town park. As of the census of 2010, there were 33,506 people, 13,143 households, and 9,232 families residing in the town. The population density was 1,269 people per square mile (489.1/km²). There were 13,791 housing units at an average density of 522.4 per square mile (201.3/km²). The racial makeup of the town was 92.8% White, 1.5% African American, 0.3% Native American, 2.3% Asian, 0.03% Pacific Islander, 1.4% from some other race, and 1.7% from two or more races. Hispanic or Latino of any race were 4.5% of the population. In the town the population was spread out with 22.5% under the age of 18, 6.5% from 18 to 24, 24.9% from 25 to 44, 30.2% from 45 to 64, and 15.8% who were 65 years of age or older. The median age was 42.5 years. For every 100 females there were 93.6 males. For every 100 females age 18 and over, there were 90.0 males. The Cumberland Public Schools is a comprehensive PK-12 public school system serving the Town of Cumberland, Rhode Island. The school system enrolls approximately 5,000 students in preschool, elementary, middle and high school. The five town elementary schools include Bernard F. Norton School, Garvin Memorial School, Ashton School, Community School, and John J. McLaughlin Cumberland Hill School. Students in grades 6-8 attend one of two middle schools; Joseph L. McCourt Middle School (formerly Cumberland Middle School) or North Cumberland Middle School. All students in grades 9-12 attend Cumberland High School, a modern campus spread over 2.5 acres (10,100 m2) on Mendon Road/Route 122. For many years, the district held the distinction of the lowest per pupil spending in the state using comparative financial data from the Rhode Island Department of Education. Over the past ten years, however, the taxpayers have provided substantial resources to the schools through bonds to improve school facilities. Most recently these bond funds were spent on targeted improvements at Ashton School, John J. McLaughlin Cumberland Hill School and Cumberland High School. Thanks to the financial generosity of the citizens of the Town of Cumberland, major renovations have been completed at Cumberland High School as part of the "CHS 2010" program. Originally opened at its Mendon Road location in 1961, Cumberland High School was formally rededicated on September 27, 2008 after five years of construction and renovation. A new facility, known as the Wellness Center, was built, including three basketball courts, an indoor track, and health and physical education rooms. Also, new music and art rooms have been constructed in the location of the former gymnasium. The final phase of the renovations and additions include a new 15-classroom science and technology wing and a new servery and cafeteria seating 600 students. With a major cycle of facilities updates completed, the district has adopted a three-year strategic plan focused on 21st century skills for students and teachers to create equitable learning opportunities for its five thousand students. A primary emphasis of the district's Strategic Plan is a collaborative effort to design and build a Town Learning Community that will invigorate community support for the public education system. The Strategic Plan calls for the district to invest funds on teacher professional development in learning styles differences, gifted education and the integration of new classroom technology in all areas of instruction. Also, the plan focuses on strategies to personalize learning for students through differentiated instruction, advisory programs and the district's K-12 counseling program. Nationally recognized educational organizations are partnering with the Cumberland schools in their improvement efforts. In literacy, the district is working with the Hasbro Center for Teaching Excellence/Highlander-Dunn Institute and the HILL for Literacy and, in mathematics, the Charles A. Dana Center at the University of Texas at Austin. The goal of the Cumberland Literacy Initiative is to raise student achievement in reading by training all elementary teachers as master teachers in literacy. The Cumberland Mathematics Initiative aims to provide a guaranteed and viable curriculum in mathematics for every student, every day, in every classroom in Cumberland, thereby raising the mathematical proficiency of all students in grades kindergarten through twelve. The school system is led by its seven-member School Committee that is elected to serve for two years and includes a Chairperson, Vice-chairperson and Clerk. The School Committee hires a Superintendent of Schools to administer policies and to manage and lead learning in the district. The Cumberland Superintendent of Schools (in chronological order) are Mr. Robert Condon, Dr. Robert McGinnis, Mr. Rodney McFarlin, Dr. Robert Patterson, Mr. Robert Wallace (1993–1996), Mr. Joseph Nasif (1996–2005), Dr. Donna Morelle (2005–2011) and Dr. Phil Thornton (2011–Present). Cumberland is home to the Arnold Mills Fourth of July Parade and Road Race, which is held each year to celebrate (Fourth of July). The first recorded Arnold Mills Parade was held on July 4, 1927. A popular event, Cumberlandfest, is held each year on the second weekend of August at Diamond Hill Park on Diamond Hill Road. This event features a carnival, with rides and various venues, as well as live entertainment and a small fireworks show. Proceeds go to the town's athletic programs. This event attracts thousands of people every year. Late in the year, started in 2002, Cumberland Town and Recreational Department has been putting together a "Spook Trail" in the woods of Diamond Hill Park on Diamond Hill Road called Haunted Hill. Each year they have title characters like Freddy, Jason, Leatherface, and Michael Myers, along with other characters such as scarecrows, clowns and zombies. The Blackstone River Theatre at 549 Broad Street hosts a wide variety of cultural events mostly in the form of intimate concerts encompassing the prevailing traditional cultures of the people who settled the Blackstone Valley. The Blackstone River Theatre also sponsors the annual Summer Solstice Festival at Diamond Hill State Park in Cumberland. ^ a b c d "Profile of General Population and Housing Characteristics: 2010 Demographic Profile Data (DP-1): Cumberland town, Providence County, Rhode Island". U.S. Census Bureau, American Factfinder. http://factfinder2.census.gov. Retrieved October 10, 2012. ^ ""Namesake preserves memory of William Blackstone" By Kevin Keenan". Worcester Telegram & Gazette,. 2000-07-23. http://www.telegram.com/static/crosscurrents/riveside23.html. Retrieved 2008-05-12. ^ a b "MHC Reconnaissance Survey Town Report: Uxbridge; Report Date: 1984, Associated Regional Report: Central Massachusetts;". Massachusetts Historical Commission. 1984. Archived from the original on 2007-12-02. http://web.archive.org/web/20071202071504/http://www.sec.state.ma.us/mhc/mhcpdf/Town+reports/Cent-Mass/uxb.pdf. Retrieved 2007-11-20. ^ "Geographic Identifiers: 2010 Demographic Profile Data (G001): Cumberland town, Providence County, Rhode Island". U.S. Census Bureau, American Factfinder. http://factfinder2.census.gov. Retrieved October 10, 2012. This page uses content from the English language Wikipedia. The original content was at Cumberland, Rhode Island. The list of authors can be seen in the page history. As with this Familypedia wiki, the content of Wikipedia is available under the Creative Commons License.